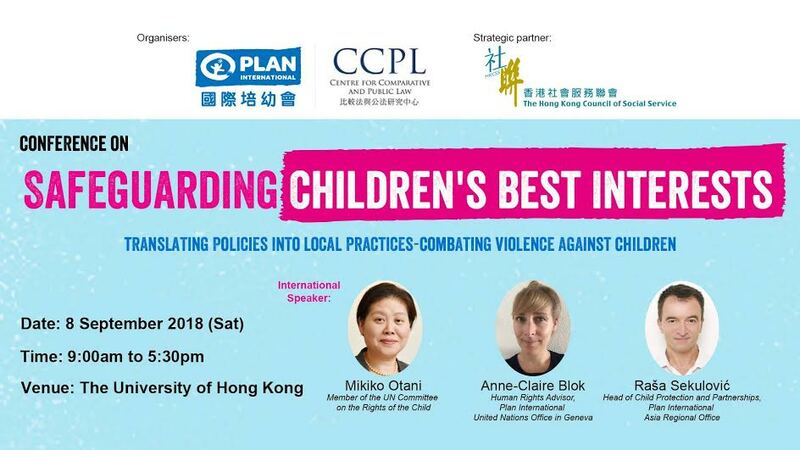 This Conference co-organised by CCPL, Faculty of Law, The University of Hong Kong and Plan International Hong Kong, aiming to serve as a vehicle for thought leadership in driving systemic change in how professionals and practitioners working with children carry out child-related assessments and decision making in the realm of policy and its implementation. Multi-sector professionals and practitioners working with children and related issues, including social services sector, medical sector, legal sector, legislators and policy makers, education section, students and researchers, etc. Shelley Leung by email at shelwh@hku.hk or by phone at 39174236 or by fax at 25498495.